Drs. Lynn Megeney, Duncan Stewart, Colin Suen, and Mohammad Abdul-Ghani have been granted a U.S. patent for an experimental approach to treat heart failure using a protein called cardiotrophin 1 (CT1). Heart failure is a leading cause of death and disability in high-income countries and occurs when the heart can’t pump enough blood through the body. A recent study showed that CT1 can trick the heart into growing in a healthy way and pumping more blood. The research team found that CT-1 dramatically improved heart function in two animal models of heart failure - one caused by a heart attack (affecting the left side of the heart) and one caused by high blood pressure in the lungs (pulmonary hypertension, affecting the right side of the heart). Drs. Megeney and Stewart hope to develop partnerships to test this protein in patients. If this testing is successful, it will take a number of years for the treatment to become widely available. 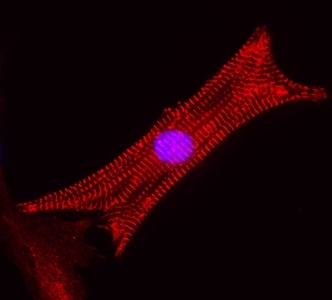 Image of heart cell treated with cardiotrophin 1 courtesy of Cell Research.